The Spartans marched slowly and to the music of many pipers in their ranks … So that the men could close on the enemy steadily and evenly and not fall out of formation. With one or two exceptions, the Persian wars of the early fifth century bc forever ended the old style of Greek warfare, which were characterized by the small-scale, single-day clashes of hoplites. The Persian Wars left two Greek city-states dominant, but as they expanded throughout the Mediterranean Athens and Sparta eyed each other warily. Athens upgraded the navy it built for the Battle of Salamis. Sparta and its allies continued to focus on hoplites, but they also added lightly armed skirmishers and cavalry to the mix. By the time of the Second Peloponnesian War in 431 bc the Athenian empire spread across the Aegean Sea, its ambitions setting it on a collision course with Sparta. The first phase of the Peloponnesian War-known as the Archidamian War after King Archidamus II of Sparta-went well for Athens. Guided by Pericles, an influential statesman, Athens abandoned its fields and withdrew its population from Attica into the city. Sparta invaded Attica five times during the Archidamian War (431-421 bc), but to little effect: the “Long Walls” of Athens linked the city to the port of Piraeus, through which supplies, food, and money flowed. The Spartans had similarly bad luck in the west, losing every major engagement except Plataea, which surrendered in 427. By then a horrific plague had struck the crowded city of Athens, carrying off one third of its population, including Pericles, and with him the city’s cautious defense policy. Beginning in 427 Athens went on the offensive, meeting with considerable success, particularly at Pylos in 425, where the Athenians took several hundred Spartan hoplites hostage. Yet even as Athens encouraged revolt among the helots-the subjugated farmers whose labor supported the Spartan army-Sparta, identifying itself as a liberator from tyranny, fomented revolt among the Athenian colonies and allies, sending its best general, Brasidas, to Chalcidice. He won at Acanthus, Stagirus, and Amphipolis, where he died, as did Cleon, a powerful and hawkish Athenian statesman during the Peloponnesian War. In 415 bc Athens mounted a large-scale invasion of Sicily, aiming at Syracuse, a Spartan ally whose growing power had raised Athenian suspicions. The poorly conceived attack resulted in the loss of an entire fleet, 40,000 soldiers, and considerable prestige. Wealthy Athens managed to rebuild the navy, but damage to morale proved unsalvageable. Sparta invaded Attica again, this time building fortifications and encouraging defections. Dependence on Athens’ colonies for food and supplies strained them to the breaking point, lending credence to Sparta’s self-description as a liberator. Revolts occurred throughout the empire, including in Anatolian cities pressed by Persian rulers who were allied with Sparta. Political strife broke out in Athens itself in 411 bc. In the same year revolts erupted in Rhodes, Abydus, Lampsacus, Thasos-and, crucially, in Athens’s breadbasket, Euboea- nearly shattering the empire. Nevertheless, Athens fought on gamely, winning victories at Colophon, Chalcedon, Byzantium, and Thasos. By now, however, the Spartan navy rivaled that of Athens and a blockade of the city, followed by a naval victory at Aegospotami in 405 bc, sealed Athens’ fate. Spartan troops took the city-the Long Walls were dismantled and the long Peloponnesian War ended. In a passage extolling the virtues of order the fourth-century historian and former general Xenophon waxes eloquent on the beauty of a well-organized army. An orderly army elates its watching supporters, but strikes gloom into its enemies. I mean, who – if he is on the same side – could fail to be delighted at the sight of massed hoplites marching in formation, or to admire cavalry riding in ranks? And who – if he is on the other side – could fail to be terrified at the sight of hoplites, cavalry, peltasts, archers, slingers all arranged and following their commanders in a disciplined way? As we can see from Xenophon’s list, hoplites were the most conspicuous and usually the most important Greek troops, followed by the four other major types of land troops in descending order of status: cavalry, peltasts (light-armed spearmen), archers and slingers. Most scholars argue that the basic trend in military forces from the early archaic period through the classical period was the establishment and then the decline of hoplite primacy. According to this model, hoplite supremacy was established in the early seventh century. All cities that wanted to win land battles had to man large hoplite armies and fight it out on the small agricultural plains of Greece. Light-armed troops and cavalry were of minimal significance. 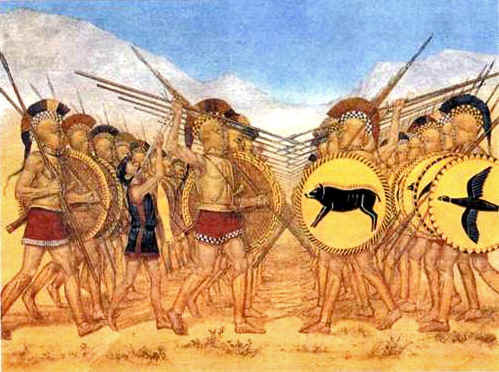 The late fifth and the fourth centuries saw the dominance of hoplites challenged as their vulnerabilities and the advantages of mixed armies became obvious. This view, although correct in the main, has been challenged on two fronts. First, it may be that the hand-to-hand fighting method of the classical hoplite developed slowly and that hoplites coordinated with other types of forces throughout the archaic period: a throwing spear – recognizable by the throwing straps which added spin for a truer throw – appears in addition to the classical thrusting spear on vase-paintings up to the late seventh century; the seventh-century poet Tyrtaeus describes light-armed troops interspersed with the hoplites; Attic vase-paintings in the late sixth century depict archers among hoplites. Then, almost as soon as we have detailed descriptions of wars between Greek city-states, that is, in Thucydides’ account of the Peloponnesian War (431-404), we hear of the defeat of unescorted hoplites in rough terrain. So the dominance of the hoplites may not have been as long or as complete as previously thought. Second, scholars have argued that the decline of hoplite warfare in the fourth century is overstated. Hoplites may have been vulnerable and slow on the rough terrain and passes that dominate the central Greek landscape, but agricultural states need to control the fertile plains and must fight set battles there. For this, no force was as good as the heavily armed Greek hoplite formation, the phalanx – certainly according to the many Near Eastern monarchs who hired Greek mercenary hoplites. So while the hoplites may not have been the only important soldiers during the archaic period, they were usually the most numerous and decisive force in battles of the fourth century, the period of their supposed demise. Andrewes, A., “Thucydides and the Persians”, Historia, 10 (1961): pp. 1–18. Brunt, P.A., “Spartan Policy and Strategy in the Archidamian War”, Phoenix, 19 (1965): pp. 255–280. Cawkwell, George L., Thucydides and the Peloponnesian War, London and New York: Routledge, 1997.
de Ste. Croix, G.E.M., The Origins of the Peloponnesian War, London: Duckworth, and Ithaca, New York: Cornell University Press, 1972. Kagan, Donald, The Outbreak of the Peloponnesian War, Ithaca, New York: Cornell University Press, 1969; reprinted 1989. Kagan, Donald. The Archidamian War, Ithaca, New York: Cornell University Press, 1974; reprinted 1990. Kagan, Donald. The Peace of Nicias and the Sicilian Expedition, Ithaca, New York: Cornell University Press, 1981. Kagan, Donald. The Fall of the Athenian Empire, Ithaca, New York: Cornell University Press, 1987. Lewis, D.M. et al. (editors), The Fifth Century BC, Cambridge: Cambridge University Press, 1992 (The Cambridge Ancient History, vol. 5, 2nd edition). Thucydides, Works, translated by C. Forster Smith, revised edition, 4 vols, London: Heinemann, and New York: Putnam, 1928–1930 (Loeb edition). Thucydides, Works. History of the Peloponnesian War, translated by Rex Warner, revised edition, Harmondsworth and Baltimore: Penguin, 1972. Xenophon, Hellenica, translated by Carleton L. Brownson, London: Heinemann, and New York: Putnam, 1918 (Loeb edition; many reprints). Xenophon. A History of My Times, translated by Rex Warner, revised edition, Harmondsworth and New York: Penguin, 1978.